Windrow disease presents special challenges. Photo credit Troy Walz. Windrow disease presents special challenges. Weeds often invade, requiring spraying to maintain quality and protect stands. During the next growth period, plants that were not smothered regrow rapidly, while plants underneath the windrow suffer delays. Part of the field often will begin to bloom while windrow-stressed plants are still short and tender. So when do you harvest? When the first plants begin to bloom or do you wait until injured plants are ready? I suggest using two factors to tell you when you should cut — the health and vigor of your stand and the nutrient needs of your livestock. For example, is your alfalfa stand young, healthy and regrowing well? If not, wait to cut until stunted plants begin to bloom so you can avoid weakening them even more. 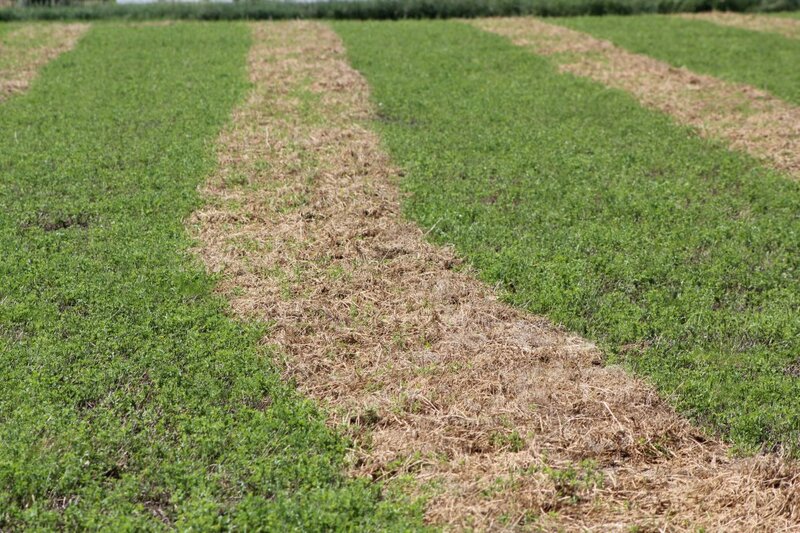 But, if your alfalfa is in good shape, then cut when it will best meet the needs of your animals. Dairy cows need alfalfa that is cut early, so harvest when the first plants reach bud to early bloom stage. Regrowth of injured plants may be slow after cutting, but this sacrifice is needed for profitable milk production. Beef cows, though, do not need such rich hay. So if the hay will be fed to beef cattle, let stunted plants recover, and then cut when they are ready to bloom. Hopefully, by next cut, growth will be more uniform, plants healthy, and production back to normal.